We offer separate LIN stack solutions for LIN Master and LIN Slave. The LIN stack solution is designed to be production grade, ready-to-deploy solution. Following are some of the features of our LIN software stack. The LIN subnet is based on a master-slave architecture and we have partnered with our customers to deliver a customized LIN Master and LIN Slave solutions. Within the In-Vehicle Network, LIN Master is integrated with Master ECU (which is part of Body Control Module). This saving in efforts translates into reduction time-to-market and thus development cost. Suresh brings 13+ years of automotive industry experience on the table. His grasp on the technology and the ever-smiling demeanor gives an assurance to the customers that their project is in their right hand. As a true leader, he always has the time to talk to this team and guiding them in critical circumstances. His ability to understand the requirements and the customers’ pain-points is what makes him a favorite among his peers and the customers. Ratish has this unique ability to connect with the customers at a personal level. There are very few who understands the global automotive market as Ratish does and that reflects in the way he is able to solve customers’ doubts. Ratish has been instrumental in establishing Embitel as a trusted technology partner across the US region and now in East Asian region. 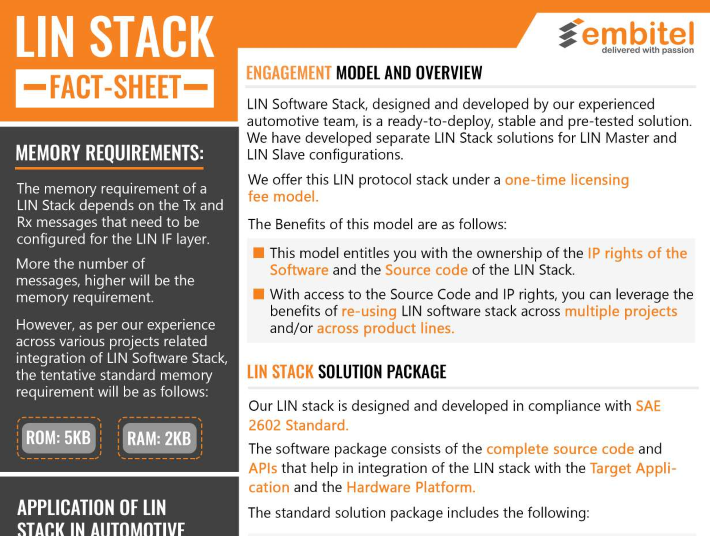 Refer to this LIN protocol stack solution factsheet which is designed to provide details of the technical specifications like memory requirement, LIN Stack integration & support services etc. Please refer to LIN software stack FAQ’s for more details. Q. Can you share details of the layered architecture of your LIN Software Stack? Q. Can you enlist the modules and the major functionalities supported by your LIN Stack solution? Interrupt based data handling (both Transmission and Reception). Error handling mechanism is part of the LIN driver software. LN IF handles both Tx and Rx messages. Tx and Rx messages will be configured in configuration (*.c, *.h) files. Q. What about the hardware dependency of your LIN Stack? Ans. LIN Drivers are developed for the specific microcontroller used in the automotive application. All other modules of the LIN stack are hardware agnostics. We have expertise in developing LIN drivers for all the widely used MCU families. This includes Renesas, TI, Fujistsu and others. Q. Can you talk about some of the automotive ECUs for which you have successfully delivered LIN stacks? Ans. Our automotive team has delivered several LIN stack projects to customers from across US, Europe and India. We can share the detailed case studies of the projects and related information, once we sign the Non-disclosure agreement. Q. Are the LIN Stack integration and configuration services part of the stack? Ans. Yes. As per our Service Level Agreement (SLA) for the LIN Stack, we will provide the software configuration and integration services, along with the LIN stack license. The integration and configuration services will take care of both low-level drivers as well as the application-level integration. Q. What kind of tests is your LIN stack subjected to, in order to ensure its integrity in production environment? Q. How is the conversion of LDF file to code, handled by your automotive team? Is it manual or tool-based? Ans. Whether to use the manual method or the PC based tool, for the conversion from LDF file to configuration file code, will depend on the size of the file. If there are considerable numbers of Tx and Rx messages for configuration, we will prefer to use our proprietary PC based auto-code generator tool. Q. Can you share some details about your proprietary tool? Ans. The PC-based tool runs on Windows OS and has been developed by our automotive team. It reads the LDF file and converts it into configuration files instantly. Designed for generating MISRA C compliant configuration files. Code generation is much faster than the manual method (Manual Method takes 2-3 weeks depending on LDF file size). It not only saves the time but also cuts down the cost. Q. Can you throw some light on the foot-print of the LIN stack? Ans. Our LIN stack is light-weight in size. The size of flash memory is 6 kB and RAM size is 1 kB. The RAM size could go higher depending on the size of the configuration file. Q. Is your LIN stack a modular software solution? Ans. Yes, Our LIN stack is completely modular. There are no global variables exchange between the programs files and every functionality is invoked with the help of specific APIs. Modularity makes the LIN stack light-weight and also easy to deploy in number of production programs, without any compatibility issue. Q. Is your LIN stack solution Master or Slave? Ans. We offer separate stack solutions for both LIN Master and LIN slave. As LIN is not a broadcast protocol, the LIN master is tasked to initiate the command and the slave has to act on it. Depending on the project specifications, we will deliver LIN master, LIN slave or both. Q. Do you provide the design documents along with the LIN software stack? Please share the details. Ans. Yes, High-Level Design Document and Low-Level Design Document, will be a part of the LIN stack package. In addition to that, we will also provide Functional Test Plan & Report and MISRA compliance Report. These documents contain every detail you may need to make some enhancements to the stacks or to integrate the stack solution in multiple production projects. What is a LIN stack? LIN is a sub-network deployed in both passenger and off-road vehicles. Unlike CAN, which is a broadcast protocol, LIN is a master/slave communication standard. Simpler functionalities like wiper, mirror control and washer etc. are usually handled by LIN network. The LIN master ECU is integrated with the body control module, from where it initiates the command. The LIN master nodes will receive the command over LIN network and act accordingly. LIN Slave nodes don’t communicate with other networks, unless initiated by the LIN master. What makes LIN important when CAN already handles in-vehicle networking? Adding too many nodes (ECUs) to the network causes Network BUS slow down. To prevent this, a sub-network is designed. The body control module usually acts as a gateway between the main network and the subnets. LIN is a single wire network best suited for small applications like wiper and washer etc. Using CAN for such application lead to increase in the software and hardware cost.